Math is a struggle in our house. My eldest, Monkey, has ADHD, and although she is bright, her trouble with focusing and scattered thinking means she is easily bored with traditional math. Instead, we must use fun math activities to harness her brain’s fun potential. All our previous math programs have left us wishing there was a better way to teach math to bright, but impatient, kids. When we were asked to try Kendall Hunt’s Math Innovations program for gifted and bright kids, I was excited. Nothing we had tried so far was working, not even our math STEM activities and I was actively on the hunt for something new. This post is sponsored by Kendall Hunt. All opinions are my own. Math Innovations follows Common Core standards, and we’ve all seen the “scary” videos illustrating how Common Core can make math take longer. To the casual observer, it looks like Common Core math is teaching kids to use the most meandering way possible to solve math problems. This was not our experience at all with Math Innovations. In fact, to date, I have not seen a math program that focuses so much on teaching children the WHY of math rather than just the how of math. There is great emphasis on teaching children to think mathematically and to solve their own problems using math. All children are taught to focus more on mathematical expression and a conceptual understanding of math, rather than a list of instructions to follow. Those of us not taught using this method often think, “why aren’t they teaching kids how to get the right answer?” In actuality, however, this style of math instruction is much less “teaching to the test” than how we were taught and boosts mathematical understanding. But kids taught using Math Innovations will actually KNOW where, how, and why to apply these mathematical concepts in real life. In Math Innovations, children are challenged to think about why they are doing that math and to examine how this form of math could be used to solve a problem in that child’s life. 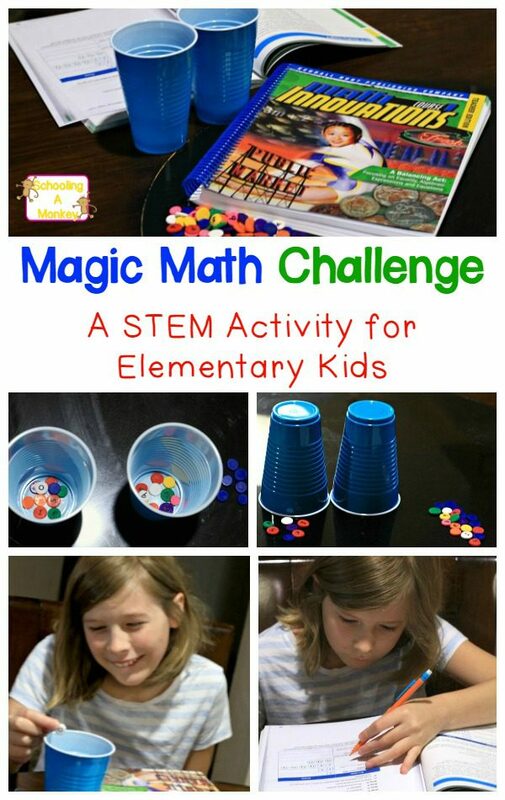 Many of the examples given in our book (which was A Balancing Act, focusing on the basics of Algebra and the importance of making equations equal) showed how children could use Algebra to do magic tricks or how to determine what supplies are necessary for a project. Much of the book focuses on getting kids to not only complete math problems, but also encourages children to create their own mathematical expressions. My sister visited us while we were trying out Math Innovations, and since she is about to graduate from the University of Texas as a Math major, I had her take a look at the book. 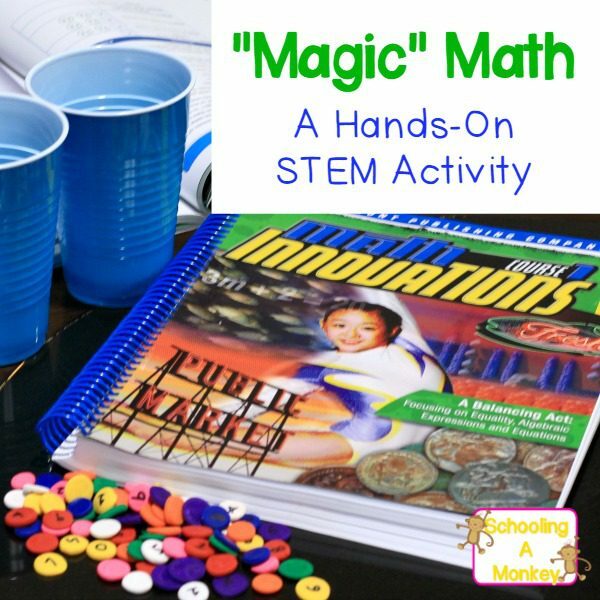 According to my sister, Math Innovations uses the techniques that she would use to translate abstract algebraic thinking into real-world hands-on concepts using manipulatives and group projects. I was impressed at the thoroughness of the teacher instructions as an English major. Even though I don’t have math teaching experience on a professional level, the clarity of the instructions not only gave me confidence to pass the concepts along to Monkey, but I also felt like I understood math much better than I ever did in school. 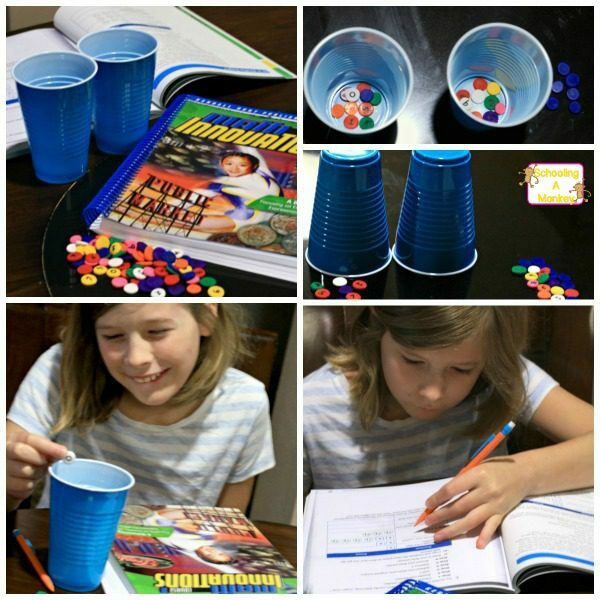 Each math concept has a hands-on component that shows children the abstract concepts of algebra expressed with real-world objects like pattern blocks, rocks, and even plastic cups and illustrates these points with fun math activities. 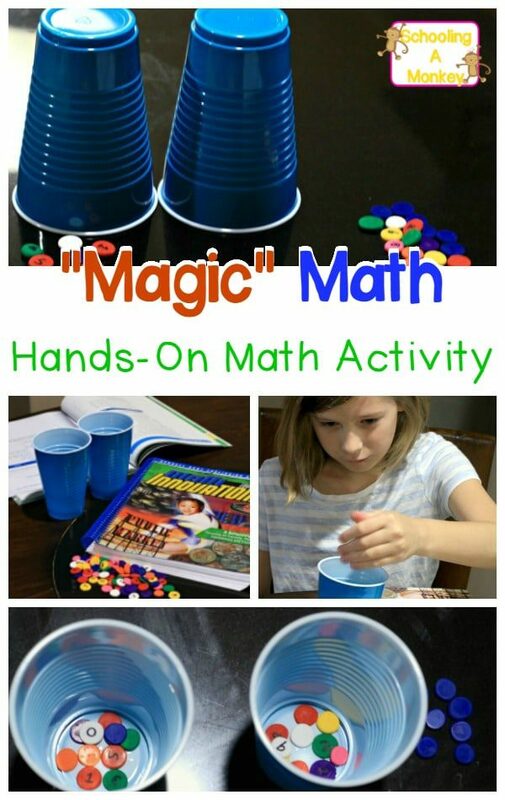 This is ideal for kids who hate math, or kids who have ADHD. Although Monkey usually struggles in math and was complaining about having to start math before her other subjects (since we usually wait until after Labor Day to start school), you can tell by these pictures she actually loved doing the Math Innovations lessons. Math Innovations has a suggested grade level of 6th (or gifted 5th grade), but Kendall Hunt also has an elementary math program starting with Pre-K. 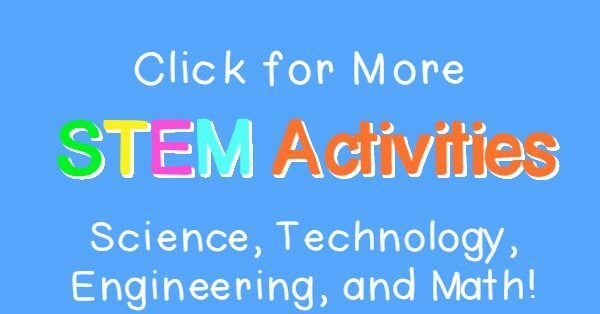 The entire program focuses on conceptual understanding, which I feel is an important foundation for any math program and a necessary part of STEM activities. 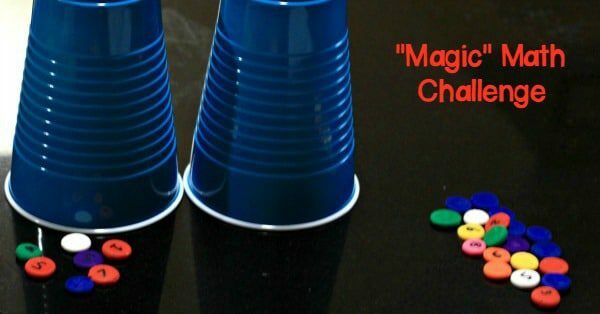 This mathematical “magic trick” uses algebraic concepts and equations to create a no-fail, “magic” formula that will always produce the same answer. The cup is used to illustrate that no matter what your mystery number is, the equation and the answer will always be the same. The mystery number is contained in the cups. This magic trick takes five steps. The answer will always be 4. 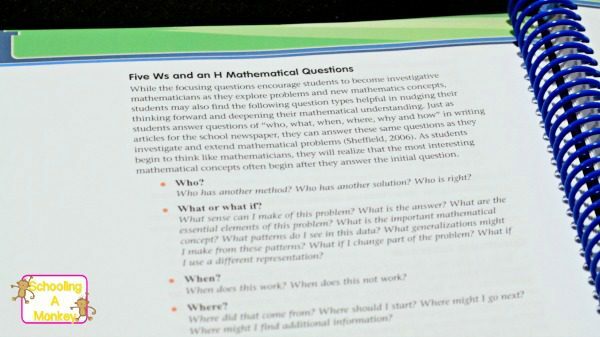 The Math Innovations book suggested that after students complete their equations, they try to come up with their own equations that will always equal a certain number.